"Measurement is the first step that leads to control and eventually to improvement. If you can’t measure something, you can’t understand it. If you can’t understand it, you can’t control it. If you can’t control it, you can’t improve it." When your business is VAS-based, there are metrics you just CANNOT ignore. These are crucial for your long-term performance and will effect your business. What will be my revenue in the next 5 years? What is driving my revenue and what is hindering its growth? Should I focus more on customer acquisition? Or should I focus more on customer retention? 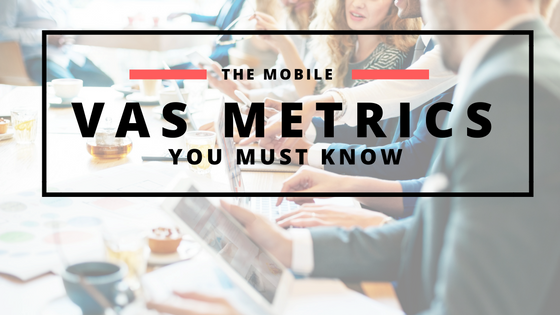 In this article, I have defined some of the key metrics for your VAS business and how you can calculate them accurately. Churn rate refers to the number of customers who cancel your service in a given month—when they leave, they’ve “churned out” and are no longer subscribing to your service. Churn rate is the percentage of customers that leave every month. Revenue Churn: Refers to the revenue lost due to the lost cutomers. This value is not proportional to the customer churn, in case your VAS services are dynamic with revenue expansion options with add-ons. That is, each lost customer might be contributing a different amount to the revenue. Customer Churn: Similar to what we discussed above. It refers to the number of customers lost in a given month. For our purposes, we are only concerned with customer churn. Mathematically, it is the percentage of customers who canceled their subscriptions in a given month. Your business is performing excellent once your churn rate turns negative. Negative churns happen when the expansion revenue from present customers exceeds the loss incurred due to churning customers. If you have ever been in business, you know what it means. Because customer acqiusition cost is key parameter for any business. For e-commerce, internet and VAS-based companies, it becomes even more important as understanding where is the customer coming from and how much you're spending to acquire him will affect your business in long-term. Customer Acquisition Cost (or CAC) defines the cost associated with convincing a consumer to buy your product or service, including research, marketing, and advertising costs. CAC is not complete in itself. There are two other parameters--Lifetime value of a customer (LTV) and months to recover CAC--which together with CAC gives a more comprehensive analysis of your business' performance. In a more comprehensive terms, it is expressed by taking entire marketing and sales cost over a given period, including salaries and other headcount related expenses, and dividing it by the number of customers that you acquired in that period. Monthly Recurring Revenue is the revenue that a company generates at the end of every month. It is the fuel of any VAS. Broadly, for a VAS, it can almost be stated as the revenue generated by the number of active paid subscriptions. Mathematically, it is a sum of previous month’s MRR, new subscriptions, and the churned revenue. Litetime value of customer is defined as the net profit you will gain from your customers during her lifetime relationship. For any VAS, I believe the life time value of customer is even more important than the number of subscriptions. This is because the more customer life time value you have the more repeat business you can be assured of. And consequently, this will also decide what should be the right customer acquisition cost for your business. Let’s say your VAS model doesn’t involve any expansion revenue. That is, each user spends a fixed subscription price per month and there is no other add-on service that he can buy. For best performance, it is important for any VAS to have the lifetime value of customer at least 3 times more than that of the customer acquistion cost. Months to recover CAC is a measure of time that will take you to recover the amount of money you invested to acquire a customer. It tells your the break even on a specific customer, group of customers or all your customers. In a VAS model business, you naturally have to spend money upfront to acquire customers. On the other hand, the revenue builds over time. Once the profit (NOT the revenue) from a customer equals the amount of money you invested to acquire that customer, you achieve break even and recover CAC. The time taken, let's say in months, to do so is known as Months to Recover CAC. Months to recover CAC is a function of cutomer acquisition cost (CAC), average revenue per customer (ARPC), and gross margin percentage (GM%). Months to recover CAC helps you predict when you will achieve breakeven and get into the green area of profits. That's why an estimate of months to recover CAC is important. For any VAS, months to recover CAC should be always less than 12 months. The lesser it is, the earlier your company will get into profit. Broadly, there are 3 stages to a VAS sign up funnel. All the above parameters that we discussed depends on how well you understand the sign up funnel and how you optimize it. Although most signup process look similar in outlook, it may vary from company to company. This model is a common way to express the sign up funnel and make relevant measurement at each step. And this is appropiate in the sense that two parts of this funnel is common across all businesses: the number of visitors that came to your sign up area and tuned into leads and how many of them actually signed up for your value added service. The goal of a VAS should be to increase the ratio of total signups to total visitors. Figuratively, it means that you need to turn your sign up funnel into a sign up pipe such that you can get most sign ups out of total visitors. Average Revenue Per Customer gives an idea of what a customer is generating in monthly recurring revenue on an average. Some people in the industry hold ARPC as a vanity metric. While not the deepest metric, when calculated and broken down properly, ARPC helps identify trends in a group of customers booked within the month against different cohorts and segments. When graphing this metric you can identify price points that customers are selecting more than others, along with being able to identify upsell/down sell trends - a major factor in the efficacy of your VAS business model. Moreover, ARPC helps in planning short-term and long-terms goals realistically and ensure if your VAS business is on a right success trajectory. To calculate ARPC, you need to account for the total MRR and the total number of customers. All the key VAS metrics that we discussed--from churn rate to average revenue per customer--are important for mangers who want to keep a bird eye's view of the company's progress. Focusing on all the paramteres while keeping an eye on the sales funnel, you can always track what results your efforts are reaping and what areas you need to improve on. Although I tried to get all the metris together, if you feel there's more to add or you want to suggest or give feedback, please feel free to put that down in the comments below.